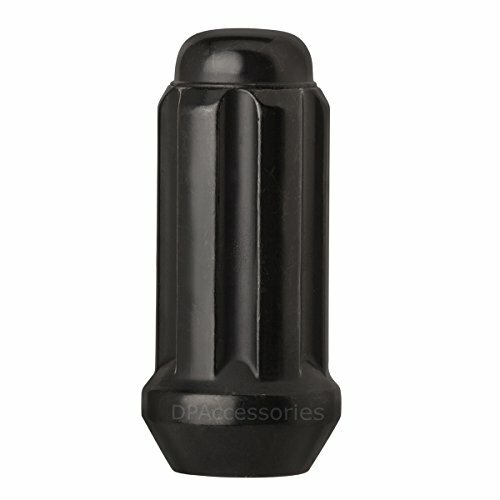 DP-Accessories closed end duplex extra long (XL) spline tuner style lug nuts are among the best in the industry. Our tuner style nuts are crafted with precision machined threads to ensure a perfect fit to your vehicle's wheel studs. Manufactured with cold forged and heat treated steel for dependable strength and durability. These lug nuts feature a proprietary cathodic black coating that gives the durability of high quality chrome and the sharp look of satin black paint. Our lengthy multi-point quality control process ensures that every nut we handle is created with the same love and care as the one before it. For all your aftermarket wheel and wheel accessory needs, always come to DP-Accessories. To order additional spline installation tools, please see DP-Accessories part number D5110K. Please note that these closed end duplex XL spline tuner style lug nuts are intended for installation on aftermarket wheels only. They will not fit on factory OEM wheels. BEFORE YOU PURCHASE: These lug nuts WILL NOT fit on factory wheels. The vehicle compatibility tool on this listing can only match the thread size to your vehicle. FITS: Aftermarket or custom wheels that require slim lug nuts for small lug holes. REQUIRES: 13/16" (21mm) and 22mm hex spline tool/key part # D5110K for installation and removal (Sold separately). INCLUDES: 100 Black Closed End Duplex XL Spline Tuner Lug Nuts.